Illustrates the Young Territory and Bexar Territory, two early counties in West Texas. 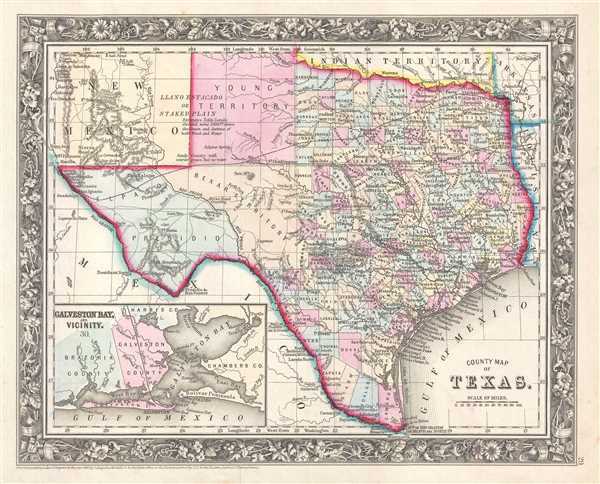 This is an 1861 Samuel Augustus Mitchell Jr. map of Texas and part of New Mexico. The map depicts the region from western New Mexico to Arkansas and Louisiana and from the Indian Territory and northern Texas to the Rio Grande River and Mexico. Highly detailed, notations concerning railroads, topographical features, and cities are included. Color coded at the county level, each county is labeled and includes the county seat. The Young Territory and Bexar Territory are illustrated and labeled, along with early configurations of El Paso and Presidio counties. The Young Territory was created on August 19, 1856 and eliminated on November 19, 1876. An inset map of Galveston Bay and Vicinity is situated in the lower left corner. One of the most attractive atlas maps of Texas to appear in the mid 19th century, the whole is surrounded by the attractive floral border common to Mitchell atlases between 1860 and 1866. Mitchell, S. A., Mitchell's New General Atlas Containing Maps of the Various Countries of the World, Plans of Cities, Etc., embraced in Forty-Seven Quarto Maps, Forming a series of Seventy-Six Maps and Plans, together with Valuable Statistical Tables (Philadelphia: S. Augustus Mitchell, Jr.) 1861. Mitchell's New General Atlas was published by Samuel Augustus Mitchell, Jr., the son of the prolific cartographer Samuel Augustus Mitchell. Many of the plates are derived from the his father's Mitchell's Universal Atlas, but not directly. The Mitchell's Universal Atlas was initially sold to Thomas, Cowperthwait, and Company in 1849, and again to Charles Deliver in 1856. It was Deliver who introduced the new vibrant color scheme, abandoning the older Mitchell's Universal Atlas green borders and themes for bright reds, blues, and yellows. Samuel Augustus Mitchell, Jr. acquired the Deliver plates in 1859. He added his own vine motif border, but doubled down on the vibrant color scheme, thus introducing to the American public the most vividly colored American atlas of the 19th century. In 1860, he published the first edition of his New General Atlas and, despite a slump in sales during the American Civil War, attained a level of success to rival his father. Mitchell would continue to published the New General Atlas until 1887, when the firm formally closed.